These cardio gloves are designed specifically for her but are fashioned in a style made popular by Bruce Lee. The open finger style allows for grabbing and ground work which is essential if you want to get into the octagon. They have a very light design but also have padding at the knuckles to offer protection. These gloves aren�t just for MMA practitioners. The light construction can be used and an upgrade from standard handwraps. They can be used for heavy bag workouts, cross fit, shadow boxing, and all cardio exercising. 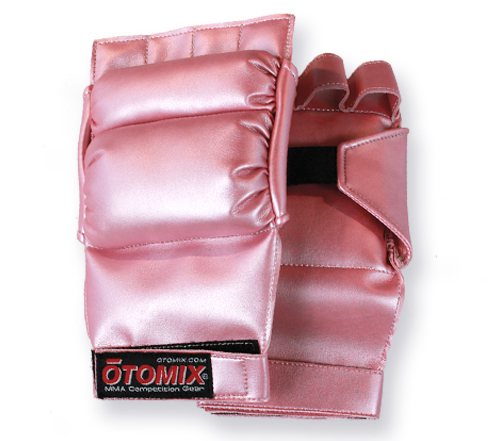 Gloves are made of metallic pink faux leather and feature a Velcro wrist wrap. Palm is open allowing for air flow. Gloves are available in sizes small through x-large.